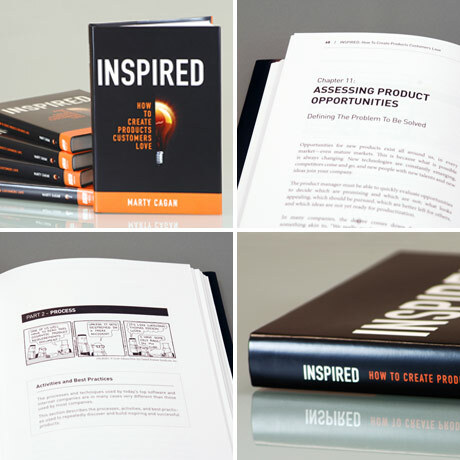 Recently I’ve been reading an excellent book by Marty Cagan ‘Inspired: How to create products that customers love’. Over the past 30 years, Marty Cagan has defined and built products for some of the most successful companies in the world, including Hewlett-Packard, Netscape Communications, America Online, and eBay. He’s the founder of Silicon Valley Product Group. I saw Marty talk (see below) at last year’s excellent Mind the Product conference in London, and his talk covered a lot of the themes in the book and expanded on these. Although the book is now over 5 years old, it’s still a relevant and useful guide that shows how the best companies create inspiring and successful products, and how you can too. Many of the themes in the book are consistent with the lean startup approach to product development – the ‘minimum product’, agile development and customer discovery. Eric Ries’ skill was in creating a common language and unifying brand which kickstarted a global movement, bringing customer value to the heart of product development and a methodology that is geared towards startups. Here I outline the main points covered from both the talk and book, and how you can adopt some fundamental practices that will help you creating winning products. Cagan’s top rule is to begin with vision and passion. But passion and vision without applied wisdom will get you nowhere fast. Make a conscious effort to nail this and you’ll avoid what Cagan says is probably the single biggest reason for failed products. Before you jump into the solution, it makes sense to know what problem, you’re trying solve, who you’re trying to solve it for, and how you’ll know if you are successful. Get to know your customers and their world to ensure the product you deliver has real value. The primary responsibility of the startup founder (or product owner) is to discover a product that is valuable, usable and feasible. It makes no sense to proceed to building something until you have evidence that you have discovered this product. For most software products, user experience is all important. Devising a good user experience requires that you collaborate closely with an interaction designer and an engineer to come up with something that is valuable, usable and feasible. Get deep insight into your target customers and have great reference customers at launch by setting up a charter user program. Your goal is to end up with at least 6 happy, live, referenceable customers from your target market. The key is to choose customers that believe there is a real problem to solve and they need it solved as quickly as possible. Making choices is one of the key roles of a product owner. Create a set of product principles to help you identify and prioritise what you believe is important and also serve as a way for you to understand the DNA of your company. One of the most important product discovery techniques is to create a high-fidelity prototype. It forces you to think much deeper about the solution and enables you to test your ideas out with real users. Knowing how to get feedback on product ideas is probably the singles most important skill for product owners. There are lots of product teams that give up too quickly. They’re giving up too early. Our job is to be stubborn on vision, but flexible on details. But sometimes, we have to distinguish vision from illusion; sometimes, it’s just never gonna happen. You should be using data to make important decisions, especially when trying to improve an existing product. Improving a product is not about adding features that customers request; it is about analysing the product’s actual user, and then relentlessly driving the product to improve the key metrics in the right direction. Marty Cagan at Mind the Product 2012 from MindTheProduct. If you need help turning your startup idea into a successful web product, drop me an email. I offer a free 20 minute sanity check for startup founders or budding entrepreneurs to share and discuss their ideas in confidence via Skype.